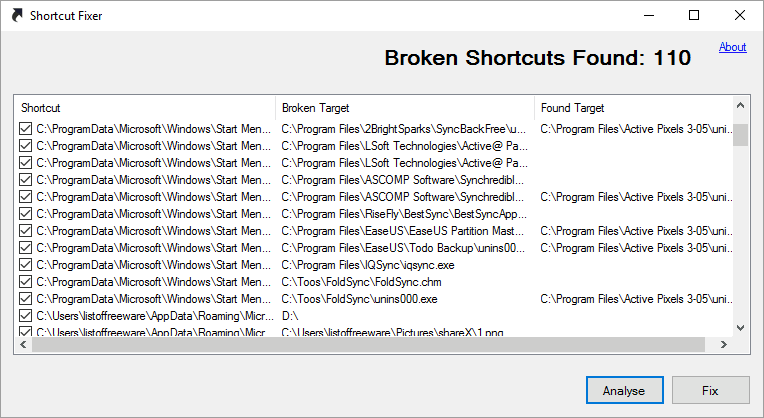 Here is a List Of Best Free Broken Shortcut Fixer Software for Windows. These free software let you scan your computer for broken shortcuts and then fix them or delete them. What are broken shortcuts? Broken shortcuts are the shortcuts available on your computer, which no longer link to their original files or folders. This may occur if the original file was deleted or moved to some other location. These shortcuts are very small in size, but a large number of them can pile up on your computer and capture unwanted space. So, you need to get rid of broken shortcuts or fix them if required. I was able to compile a list of best free software to fix broken links, which includes dedicated and integrated tools to delete broken shortcuts on your computer. These are pretty simple to use, and pin point the location and the errors of the scanned shortcuts. Some of these software scan the whole computer at a time, while some only scan a selected drive at a time. You can delete shortcuts or fix them, as required. The integrated software let you fix various other issues including the broken shortcuts. 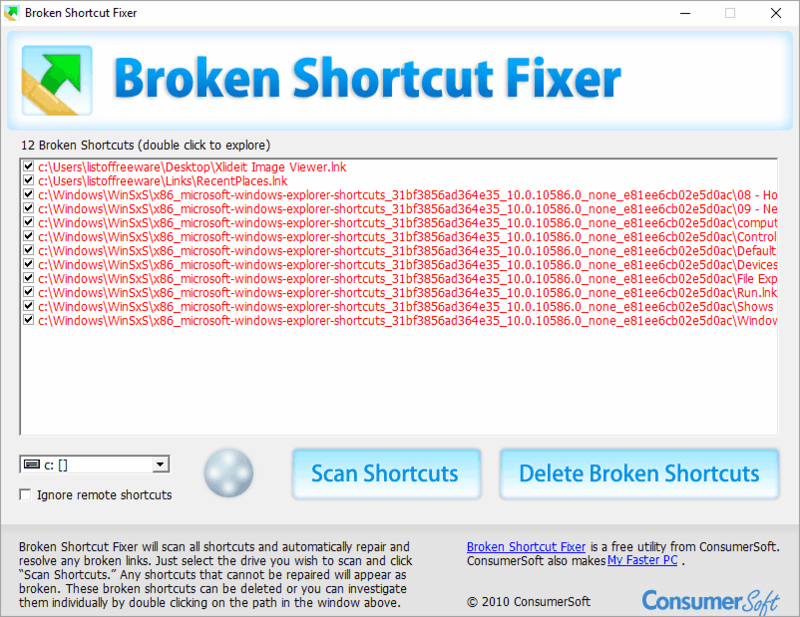 Go through the list to know more about these broken shortcut fixer software. Here you will also know how to delete broken shortcuts. Shortcut Fixer is the one of my favorite software to fix broken shortcuts, as it scans your computer completely to display shortcuts with errors. While fixing the broken shortcuts, if the target link is found, then the shortcut is fixed or deleted automatically. Its pretty simple and easy to use. You can also checkout the list of Best Free Computer Shutdown Timer Software, Hard Drive Repair Software To Fix Bad Sectors, and Software To Control Mouse With Keyboard. 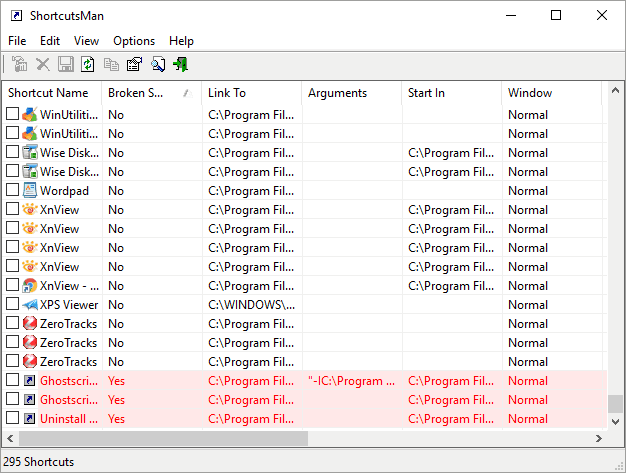 Shortcut Fixer is an Open Source broken shortcut fixer software. This is a simple software with analyze and fix options. Click on Analyze option once you open this software. This scans the broken links available on your computer. The result displays Shortcuts, Broken targets, and Found targets. Select the broken links and click on Fix button. If the target link of the shortcut is found, then its fixed, else the link is deleted. Broken Shortcut Fixer is a dedicated software to fix broken shortcuts lying in your computer. The only purpose it serves is to scan your computer for broken shortcuts and fix them. A very neat and simple interface lets you select a particular drive from your computer to scan for shortcuts. Once the scan is complete, the list of broken shortcuts is displayed. The list displays the shortcuts with their location on drive. Double click a shortcut to Explore it. You can select all the broken links or just few to delete them. There’s an option to Ignore Remote Shortcuts. Puran Utilities has a wide variety of tools for your computer; one of them is Fix Shortcuts. Click on the option to open the Fix Shortcut interface. The interface displays all the connected drives to your computer. All you have to do is select a drive and then scan it. It displays all the Shortcut Links in the scanned drive. You can stop the scan anytime during the scan. Now all the shortcuts are displayed, including the fixed ones and the broken ones. You can select the Not Fixed shortcut and fix them. You can also choose to fix manually or to Delete shortcuts. A selection of multiple shortcuts can be made to take actions. Choose another drive and repeat the action to fix broken shortcuts in that drive. 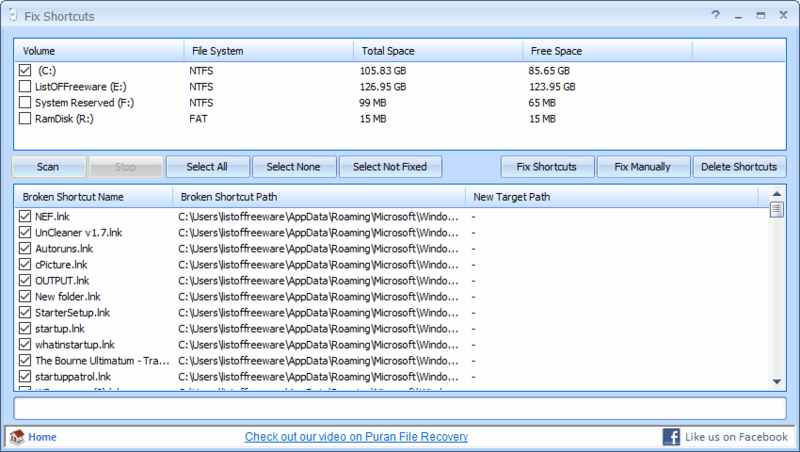 Other tools available in Puran Utilities are: Disk clean, Uninstall, Startup manager, Services manager, Delete empty folder, Registry cleaner, Data recovery, File recovery, Permanent delete, Registry defrag, Puran defrag, Duplicate file finder, Wipe disk, Shutdown timer, Splitter, Delete history, Batch fix, and System info. ShortcutsMan is another dedicated software to manage computer shortcuts. It scans your computer and displays the working and the broken shortcuts. The broken shortcuts are displayed in red color. You can view the shortcut name, broken shortcut status, link to file, and shortcut file name. Select a broken shortcut to resolve it, delete it, save, or copy. You can also make multiple selections. An HTML report can also be generated for the scanned result. Right click on the selected items to view the menu to perform actions. 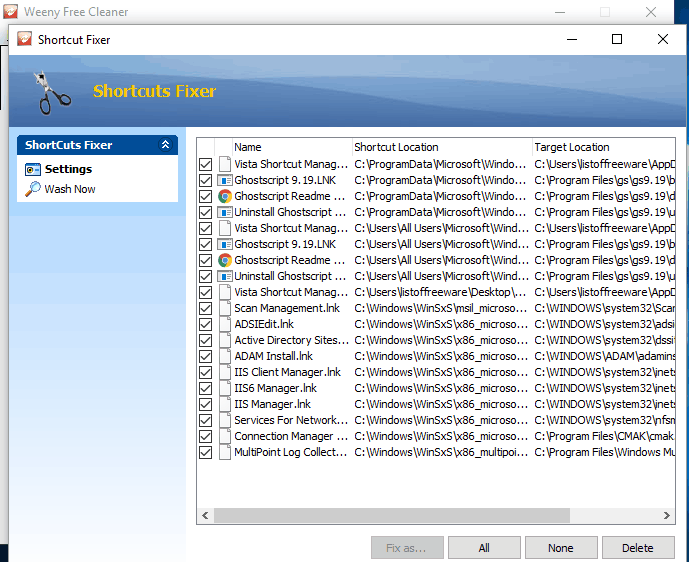 Bad Shortcut Killer is another dedicated freeware to fix broken shortcuts. Unlike other software, you do not have to choose a specific drive to scan for shortcuts. Simply click on Find Bad Shortcuts to scan your computer for all the broken shortcuts. Once the scan is complete, the result is displayed. The results in the list of broken links can be selected all at once. You can also select one or more broken shortcuts. Click on Delete Selected Shortcuts to delete them from your computer. 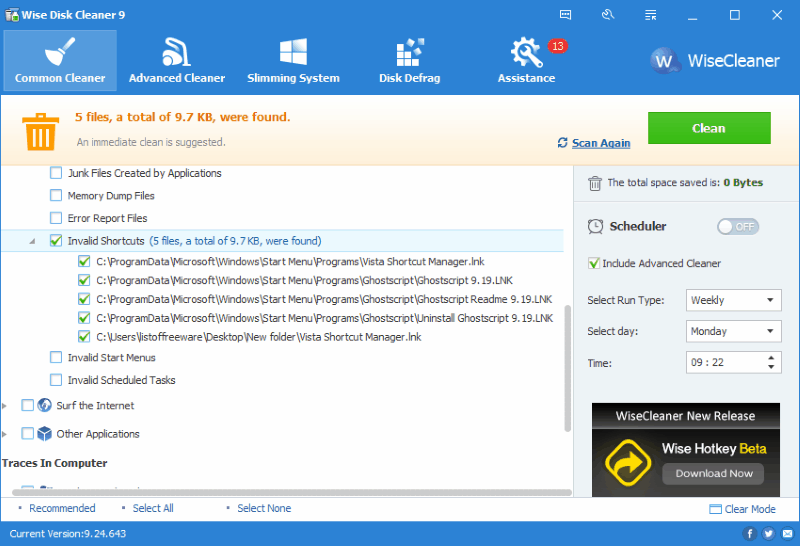 Wise Disk Cleaner is a free Windows disk cleaner software, which can be utilized to clean invalid or broken shortcuts. You can choose to scan the computer for invalid shortcuts or all the junk files. If you want just to scan and clean just Broken Shortcuts, go to the Windows System in the Common Cleaner Tab and check the Invalid Shortcuts option. You may or may not check other options to scan. Once scan is complete, click on Clean option to remove broken shortcuts. You can also scan your computer for internet junk, cookies, application traces, etc. Disc defrag option is also available. Weeny Free Cleaner is a free computer cleaner with a dedicated tool to clean broken shortcuts. You can either clean broken shortcuts or fix them. Click the Shortcut Fixer button, a new window will open. Here you can select a drive to look for shortcut errors or scan all the drives at a time. Click on Wash Now button to scan the invalid shortcuts. All the shortcut errors are displayed after the scan with name, shortcut location, and target location. You can choose to Fix or Delete the selected shortcut errors. Use this software to clean internet browser history, system history, Windows registry, and disk drives. Glary utilities has Shortcut Fixer option available to clean or repair broken shortcut. Go to the 1-click maintenance tab and click on the Shortcut Fixer option, then click on Scan For Issues button. Once the scan is complete, the issues are displayed as result. Click on Repair button to fix the broken shortcuts. 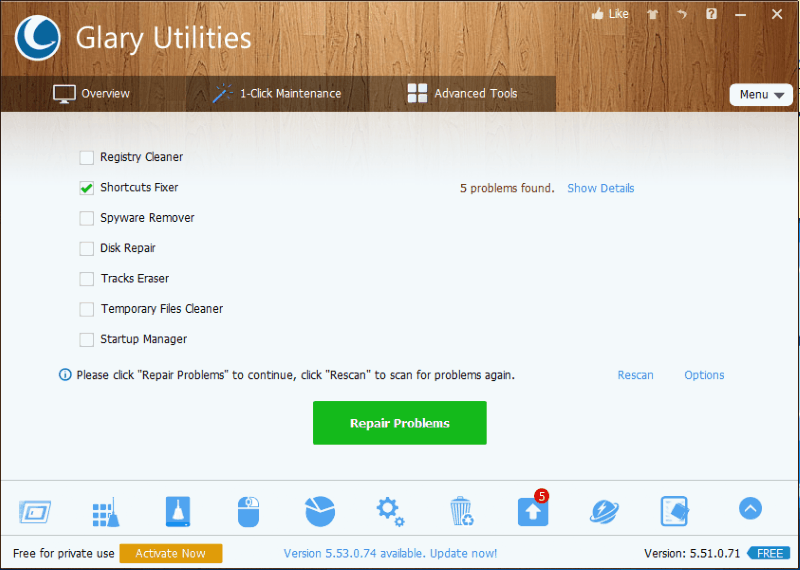 Other options in this software let you clean and repair registry, disk, duplicate files, etc. 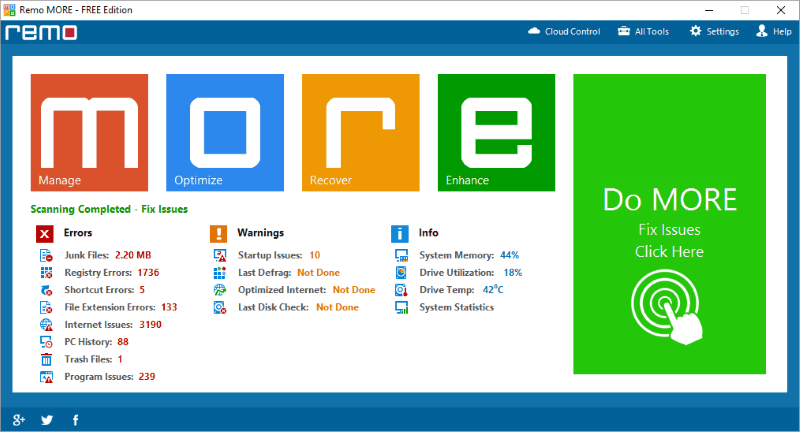 Startup manager, memory optimizer, disk defrag, encryptor, registry backup and restore, etc. options are also available in this tool. Remo MORE does not specifically lets you clean broken shortcuts, but scans and fixes them under full computer scan. MORE stands for Manage, Optimize, Recover, and Enhance. Start the scan and the software looks for junk files, shortcut errors, registry errors, etc. After the scan, Errors, Warning, and Info is displayed. Shortcut Errors is displayed under Errors section. Click on Clear to clean broken shortcuts, along with other detected errors. PC Win Booster Free is a PC cleaner software with limited functionality, and can be used to delete broken shortcuts. There are various options to scan; one of them lets you scan for broken shortcuts. Select Broken Shortcut option and select other options if you would like to scan and fix them, then start scanning. Name of the broken shortcuts with Path, Description, and Executable Path are displayed. Click on Fix Problem to fix the broken links scanned. An Uninstaller and a Duplicate File Finder is also available.